With the new TV, I’ve connected my desktop up so it acts as the monitor. Its rather good fun having a 32” LCD for Photoshop… but it is also ace for watching Films / TV, as mentioned couple days ago I am watching back through every episode of Doctor Who. The only problem is that this is a 200gb file set and with the other stuff I have on my desktop I do not have enough space for this. My 580gb of HD space is no longer enough. The only option, buy a new hard drive. Storage is just so insanely cheap these days it was a very simple decision. I jumped onto Ebuyer.com to check out what is available, and decided that an external drive was the best option. My internal drive is a Seagate Barracuda, and it has always been fine so I have stuck with Seagate, and picked up a 1TB external drive for £73. The other good news, its not being sent by Royal Mail as per the seller’s website, UPS have it in their van right now on it’s way to me, lets hope it comes before I have to leave the office for #oxtuttle. I don’t very often write an article about funny things I see, hear or watch but this is just ace. Thanks to Mr Adamson for showcasing this through Twitter. It’s a nice idea, and a really good conversation driver for the airline, how confident I would be stomping on a plane I don’t know. Also got me wondering if he raps the emergency protocols if the plane is crashing? This is kind of bad, is Grand Theft Auto 4 on the Xbox 360. I have had the game since very close to when I bought the Xbox last year. I got stuck though, and haven’t played it for a long time. But recently I thought what the hell and got it out to see how it looked on the new TV. I have been a busy boy, gigs here there and everywhere, I will strive to write a bit more about each over the comings days! 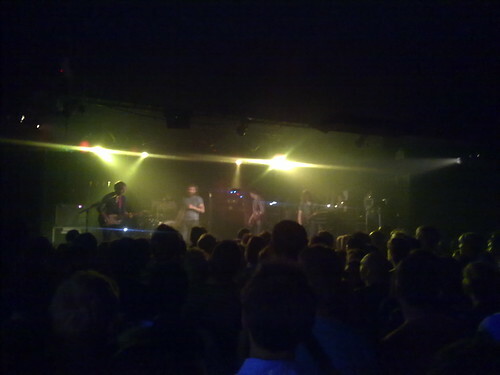 For now, you will have to settle for a couple of pictures from Idlewild at the O2 Academy Oxford on Sunday night. Check out the rest on Flickr, or check out where I’ve been / going on my Last.FM account. Were you there? Get in touch!